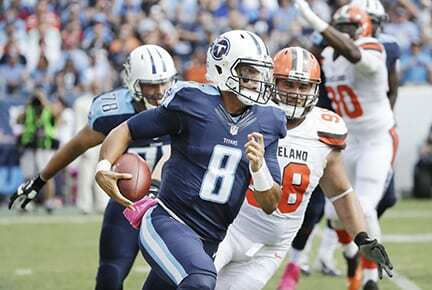 The Titans won a tough 12-9 game over the Browns on the road, improving to 4-3 on the season. It was anything but an artistic triumph, and the Titans couldn’t even score an offensive or defensive touchdown, but somehow they found a way to edge the winless Cleveland Browns 12-9 Sunday in overtime on the road. That victory improved their record to 4-3, and left them in a tie with the Jacksonville Jaguars for first place in the AFC South. It also enabled them to go into the bye week with a two-game winning streak, and avoid being Cleveland’s first victim this season. However, it was far from easy. Their best weapon was kicker Ryan Succop, whose four field goals in five attempts kept his streak of consecutive kicks made inside 50 yards alive. That string is now at 56. However the one he missed, from 53 yards out, almost put the Titans in position to lose the game. Fortunately, the Titans had another weapon on defense in safety Kevin Byard. Byard had three interceptions, including one at the eight-yard line midway through the fourth quarter. He had his first interception near the end of the first half, and his second in the third quarter. That second interception led to the Browns benching rookie quarterback DeShone Kizer and replacing him with Cody Kessler. Kessler led them on a drive that resulted in them tying the game at 6-6. Marcus Mariota had another inconsistent day, but took the Titans on four scoring drives, including one that put them ahead 9-6 and the winning one in overtime. He finished with 21 completions in 34 attempts for 203 yards and a below average QB rating of 78.4 The Titans got two key sacks on Browns’ QBs, and most importantly prevented the Browns from scoring in overtime and set up a situation where the Titans could win without scoring a touchdown. They also survived a fumble by Delanie Walker that led to the Browns first field goal. “Pretty spectacular,” was how Titans coach Mike Mularkey characterized Kevin Byard’s big day. He also praised his defense for keeping the Browns out of the end zone, but acknowledged that offensively it wasn’t a good day. At one point the Titans had a first and goal at the one-yard line and couldn’t get a touchdown. Walker completed the game with a sprained ankle, but Mularkey felt the two week break would enable him to return when they face the Ravens at Nissan Stadium after the bye. While the Titans didn’t complete the initial seven straight weeks with the glittering mark of 6-1 or 5-2 some anticipated, 4-3 is far better than 3-4 or 2-5. Now they go back to the drawing board and hope to reinvigorate an offense that has been erratic, at best, during the first half of the NFL season.